I've been meaning to do a post like this for a long time but never really had time to actually sit down and write it. I actually recently introduced a friend of mine to this site because she got curious as to where I buy all my clothes and shoes from. So in this online store review post, I'll share some of my insightful thoughts as a customer with 4 years of shopping experience with them and to answer some FAQS that I get quite a lot from people as well. Both from friends in real life and online. First off, let's start with some general info. What is YESSTYLE? Company overview: YesStyle is the first online retailer to globally distribute a wide range of lifestyle and fashion products from Asia through their website YesStyle.com. Every season, YesStyle brings customers the latest trends along with thousands of fashion items from designers across Asia. YesStyle.com now represents the best platform for designers in Asia to connect with customers worldwide. Mission: To provide customers with an exciting shopping experience, superior service and a fine selection of affordable, high quality lifestyle products. YesStyle brings the latest fashion trends to customers worldwide. Launched in July 2006, the YesStyle.com website leverages the success of YesAsia.com's proven e-commerce platform and technology to deliver customers an exciting and unique destination for lifestyle products. With just a few clicks and strokes, YesStyle customers can help shape their lives with a variety of lifestyle products delivered straight to their doorstep. Personally, I think YesStyle is by far one of my most favourite online store that I have ever come across. I can't imagine my life without it ever since I've discovered the site 4 years back. What I like most about them is that they carry fashion that are in the latest trend and style from Tokyo, Seoul, Taiwan and Hong Kong. Being an Asian person myself and who also happen to have extreme high interest in Asian fashion and style, especially the fashion style and trends in Japan so YesStyle is like a store of dreamland for people like me! If you love Asian/Korean/Japanese fashion as much as I do then you will LOVE this online store! Another thing I love about them is they don't just sell clothing but they also sell a variety range of other things such as makeup, skincare products, bags, jewelry, shoes, life style products (travel, stationery, home essentials, personal organizers, gadgets, pet accessories, tablets/mobile/computer accessories) and more. It's like a complete Asian outlet mall but on the web! Some most frequently asked questions by people I know and general information that most people might want to know about. 1. Are clothes from YesStyle expensive? To simply answer this question...it DEPENDS! It depends on what you're buying, where it's from (the place/country it's from), the brand, the quality of the item, the style, etc. All these contribute to a big factor of the cost. Generally speaking I don't think clothes from YesStyle are all that expensive if you know where to shop and what to shop for. There are the exceptional brands and clothes from specific places that are a bit more on the pricier high end range. When I mean pricey....it can range up to $100-200. From my 4 years of shopping experience, I've come to a conclusion that brands and clothes that are usually from KOREA are more on the expensive scale. Clothes and brands from Hong Kong, Taiwan and Japan are more in the middle to cheaper range. Usually I never buy anything that is over $40-50 simply because I don't think it's worth spending so much money on clothes unless it's something that I REALLY want and like then I will consider getting it. But in general I'd say the stuff that I have bought from the site are mostly in the $15-30 range. There are times when there are sales on where I have bought clothes for as cheap as $10. So it is good to say that you can find very great cheap deals from the site when you are shopping for the right items and at the right time. I think one of the most frequently asked questions I get on this is what exactly is a onesize clothes size? Generally speaking, a onesize clothes size is like a "free size" that fits all. More specifically speaking, it's in between of a size small to medium. I have a pretty typical standard Asian body frame. And because of that I don't really have a problem fitting into the "oneseize" clothes. However, if you are a girl who's a bit more on the skinnier side then you might find a onesize item to fit quite loose and big on you. Also, in some cases on the onesize item, it will list the measurements so you can always judge by that as to whether if it'd fit you by matching the measurements to your own. And in most cases where you are buying shorts/pants, there is an option to choose your size like 24, 25, 26, etc just like how any online clothing site would. If you are actually a person who's a bit more on the bigger side, don't worry, YesStyle doesn't just sell clothes that fit the general skinny people. There are bigger size clothes for those who are not part of the general size norm. I have never bought anything that does not fit me before. (i.e. too loose or too tight) Everything I have bought from the site so far fits good and I don't have any problems at all. But that may also be just me and my standard Asian body size, lol. But I also think it's like shopping in person at an actual store. The more you shop and buy clothes from a specific store, the more you will learn and know what size fits you best. I know I always range in different sizes depending on which stores I shop at. One store I might be in a little bigger size and the other I might be in a smaller size. It's just all about experience and knowing your own body type. Generally speaking I think shipping is pretty cheap compared to other online stores that I have been to. The express 3 day shipping is only $9.99 and sometimes there is the special offer of $4.99 for standard shipping that takes about 6-10 business days to be delivered. YesStyle also offer FREE shipping when you make an order over $150. However, DO NOT pick that option, especially if you live in Canada where you get charged for custom duties and tax. I have made that same mistake like many people who think it's better to order and buy more just so you can get free shipping. Let me tell you that will be the BIGGEST mistake you'll ever make!!! I got charged two times for custom duties from DHL Canada where I had to pay $60 and $80 just to receive my packages. Like WTF....CRAZY!!! If I don't pay the person who delivered my package to me then it will be sent back to Canada post and I will have to make a trip there to pay and get it. Not cool at all! So I have learned to never make the same mistake and just split my orders into two separate packages instead. Yes, that would mean I have to pay for shipping twice but that is better than having to pay extra $60-80 just so you can get the package they sent you! And let me warn you, I have NO IDEA how these custom duty rates are calculated but it seems that they can just charge you anything and however much they like. Pretty ridiculous and stupid I know. And I have also learned from my past experience of buying things online that you should NEVER buy anything that is worth over $100 because you will definitely be charged for custom duties and tax for it. So unless you enjoy paying for custom duties and tax (which I don't!) then it's best to always make all of your online orders below $100. 4. Where does YesStyle ship from? Do they ship worldwide? Yesstyle is actually based in Hong Kong. So everything they ship is actually shipped from Hong Kong. And yes, they do ship worldwide aside from U.S. and Canada. I have seen bloggers who are from Australia and Philippines that shop at YesStyle. 5. What is the clothing quality like? Good or Bad? Again, this is a question where it depends on what type of clothes you're buying. Generally I'd say most items that I have bought are in pretty good quality with the exceptional few. I'd say to always buy things that are made out of cotton! Anything made out of cotton is usually in the more "better" quality category and everything else like polyester, chiffon, nylon, etc is more on the "bad" quality category. My mom, who does sewing for a life career and knows much about fabric quality have always told me to never buy clothes that are made out of polyester and nylon because they attract dust and lint the most and is super hard to maintain in good quality after washing it. You can always find in the description about the item where it tells you what it is actually made out of. So I'd always check that before I buy anything and as well as checking the measurements to make sure it will fit me. 6. What if the item you bought doesn't fit or you don't like it? Can you return it? YES! You certainly can. YesStyle has a 14 day return policy available which I actually have never used before. But from my understanding and what I know, you can return items that are defective, wrong size, or simply unwanted. However, YesStyle will NOT refund you the item if you simply do not want it for any reasons but instead they will give you a credit value to use on your next order and it will be deducted from your total value. In the case of an exchange size matter then they will ship the item back to you again at no cost. They actually have a postal return address that you can send to in Canada. 7. I ordered an item 2-3 weeks ago but YesStyle sent me an email stating the item is no longer in stock. Why is that and what do I do? When the item availability is listed as "usually ships within 1-2 days" that generally means they do have the item in stock available ready to be shipped and they don't really need to get it from the supplier. But if it is listed as "usually ships within 7-14 days" then it means they need to get it from the supplier and you can expect that you may or may not get the item depending on if the supplier actually has it in stock. In a case where the item is not available anymore or out of stock, YesStyle will remove it from your order. However, let say you had 4 items in your order and 2 got cancelled/removed due to being out of stock, it'd be kind of pointless just getting 2 items and paying shipping for it. So if you want to add another new item to replace it, you just simply email customer service with your name, order number and write in the comment box with a message of what you'd like to add and provide the link to the item in the email. Customer service will then send you a confirmation email that the item is added with the revised order total and they will search the item for you from the supplier. 8. Are there any sales, discounts and coupon deals? Yes! YesStyle always have sales on new arrivals and end of season sales at the end of every season. 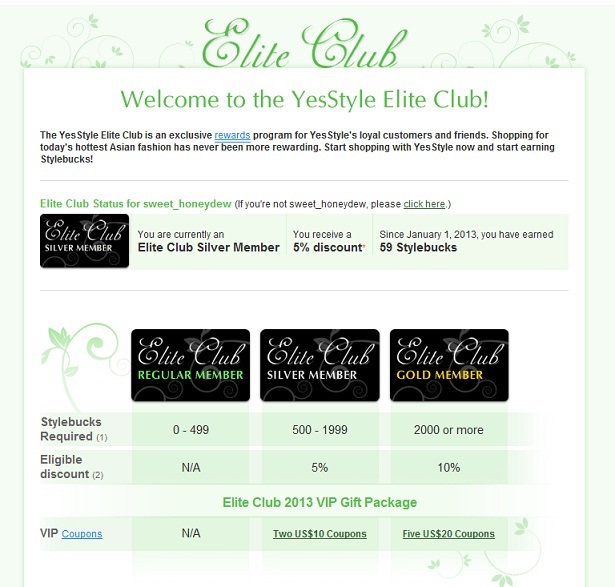 In terms of discounts and coupons, YesSytle only offers discounts for members who have earned a high amount of "stylebucks" points. Generally every time you buy something from the website, you earn stylebucks points in which they accumulate to give you discounts depending on your club status. This would actually be my only complain about the site that I don't like so much and wish they could improve better on. You have to buy A LOT of stuff from YesStyle within a year to earn a great amount of stylebucks points and the most discount you can get is actually 10%. I'm currently an elite club silver member so I get 5% off regular priced items but sometimes when there are sales on, that 5% can add up to 20-30% off. I wish YesStyle could give you a higher discount like 15% or even 20% for customers who buy frequently from the site. But I guess with the amount of consistent sales and promos they have on the site, you still somehow end of saving and buying things at a rather cheaper price. 9. When is the best time to shop on the website? Generally I'd say the best time to shop on the website is when they have end of season sales. Things can drop down to a pretty cheap price and you can get some really good deals. I used to buy clothes from the website every season but I stopped about 2 years ago because I realized that it wasn't really worth it. I live in a country where fall and spring don't last very long. And usually it takes about 2-4 weeks and sometimes even longer for my order to be processed and shipped to me due to cancellations/out of stock issues so I have to wait quite a long time before I actually receive the items to put them in use. So now I only buy clothes from the website during winter and summer where I will actually have more time to wear the clothes that I got from the website. I just find that it's more "worthwhile" and I'd buy clothes at the local stores in the mall where I live for fall and spring. Hello H&M and Forever21! lol. 10. Is there an actual YesStyle store? Yes there is! 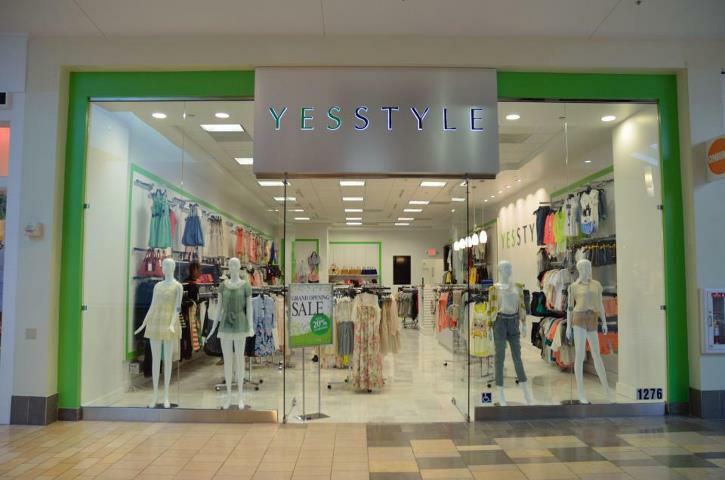 YesStyle currently has one store in the United States located in San Francisco. I will also be doing another shoes haul and review from the site as well as my last one seemed to be a really popular post where I get the most views and search results for. This time I'll do one for summer shoes because my last one was more for fall and winter.